wdnicolson.com - An NRL Blog: NRL Finals 2011 - Manly-Warringah Sea Eagles v North Queensland Cowboys 3rd Qualifying Final Preview - What's The Game Plan? NRL Finals 2011 - Manly-Warringah Sea Eagles v North Queensland Cowboys 3rd Qualifying Final Preview - What's The Game Plan? 8:30pm (Local) Saturday 10 September @ Sydney Football Stadium, Sydney. NRL Finals Week 1 Review. The Semi Finals are under-way, so join Matthew Duncan and Warrick Nicolson as they dissect the wins by the Storm, Sea Eagles, Broncos and Tigers in the Qualifying Finals. The Cowboys and Knights are finished for 2011, but the Warriors and Dragons get a second chance - do they deserve one? There are audio highlights of all the games plus the best quotes from the press conferences. 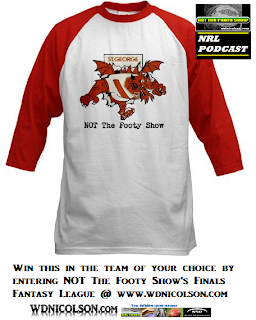 Our Elimination Semi Finals Preview Podcast will be out Thursday as we look to NRL Finals Week 2. What is the Game Plan for Saturday Night Football? Slow the play the ball down. Has been the strength of the team all year but minus two of the best exponents in Jason King and Glenn Stewart - we need to find time for our defensive line and keep the game at our pace. Spot Johnathan Thurston in defence. Obvious one but he's not a great defender at the best of times and this has to be exploited. Focus on Brent Tate and Willie Tonga. When they get the ball Tonga and Tate rarely pass - so hit them hard and hit them early. Make North Queensland beat us with the cut out pass to the wingers. Make Matthew Scott defend a lot in the opening 25 minutes. He's their forward leader - but rarely has a high tackle count. Make him work. North Queensland's left edge defence is susceptible so give our right edge lots of early ball. At the same time Kieran Foran needs to play both sides of the field to cover for the loss of Glenn Stewart's playmaking on the right. Rotate Brett Stewart, Michael Robertson and Will Hopoate at fullback to manage Brett Stewart's knee. Especially in defence. 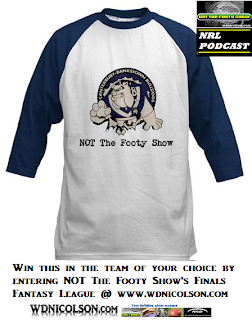 Play our brand of footy - be expansive and stick to what has worked all year - pure footy. Don't clam up. Roll up the middle behind Matthew Scott. With no Jason King or Glenn Stewart - our forward pack must take the fight to Manly up the middle and win the ruck. Choose the right choice of runner on the edges. Sometimes this year the Cowboys have had almost too many options on the edges for their playmakers to choose to give the ball too. Making the right decision will be crucial to test Manly's defence. Speed up the play the ball. Manly like to slow it down so wriggle like a worm in the play the ball and get some early penalties to make them change their style. Make Kieran Foran pay for taking the ball to the line. He can still hurt us that way but the more he gets hit - the better. Pressure Daly Cherry-Evans' kicking game. The rookie has been sensational this year but he has yet to play a game under this kind of pressure. Add to that by making every kick he makes be done so under pressure. But watch his show and go. Jamie Lyon is Manly's best option on the right but if you don't pinch in defence he resorts to a kick along the ground far too often. Make him beat you, don't open anything up for him and he'll kick. Use the cut-out pass to the wingers. Willie Tonga and Brent Tate hog the ball a little too much so make them into decoys. Get the ball into Johnathan Thurston and Matthew Bowen's hands as much as possible. Ray Thompson and Aaron Payne need to be complimentary in the Finals - rather than playmakers. Leave nothing in the tank. Finished 7th so this is do or die. Tigers will have a home semi in Week 2 against the Warriors, Dragons avoided elimination when the Warriors were beaten and will play the Broncos in Week 2. Broncos will have a home semi in Week 2 against the Dragons, The Warriors will play the Tigers after avoiding elimination. Manly will 'host' a Preliminary Final at the SFS or ANZ in Week 3. Cowboys are eliminated as one of the two lowest seeded losers in Week 1. Melbourne advance to Week 3 with a home preliminary final, the Knights are eliminated.